Harrod Sport ® 5 v 5 FS8 Folding Wheelaway Steel Football Posts, heavy duty indoor wheel away goal designed for sportshall use. 4 x Wheels and Wheel Assemblies. 2 x Wheels and Wheel Assemblies. Uprights and crossbars are manufactured from 50mm diameter x 2.6mm thick steel. Complete with detachable steel bottom backbar. Side frames are manufactured from 31.8 diameter galvanised steel and designed to fold using an integral foot operated release action and complete with flip over wheels. 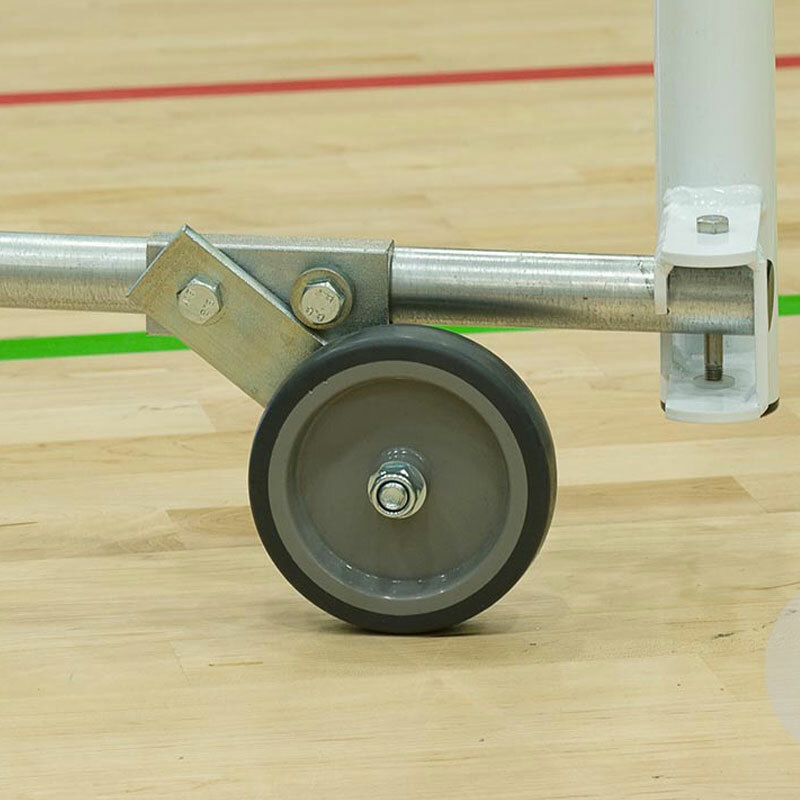 The flip-over wheel is easily operated to enable goals to be wheeled away. Large rubber pads protect and grip floors. 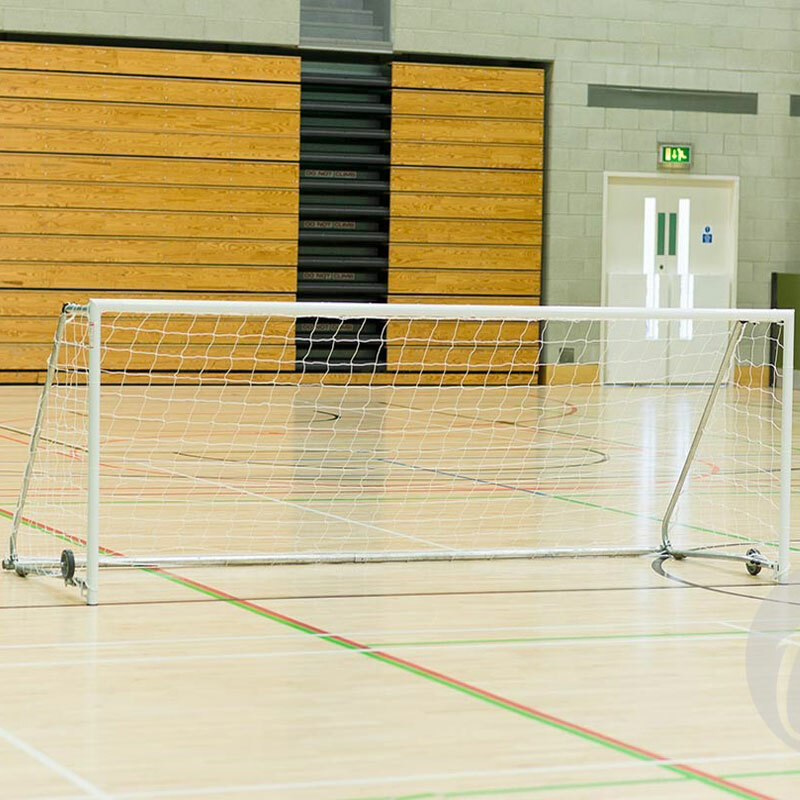 Extra heavy duty construction designed specially for use in sports halls where goals have continual use. 4.88m x 1.22m (16' x 4') - 105kg per pair, 52.5kg per single. Harrod Sport code FBL-125. 3.66m x 1.22m (12' x 4') - 89kg per pair, 44.5kg per single. Harrod Sport code FBL-126. 2.44m x 1.22m (8' x 4') - 74kg per pair, 37kg per single. Harrod Sport code FBL-127.